Arvind's World: Russell Group of Universities - British equivalent to Ivy League of US or.. ? Russell Group of Universities - British equivalent to Ivy League of US or.. ? Call it ignorance or illitracy (the exact expression though in my mind is 'koopmanduk'), I came to know of Ivy League Universities of US as late as in 2005 and that too when I started looking for colleges to pursue my Masters’ in Public Policy. Likewise, I learnt about ‘Russell Group of Universities’ in UK only after I landed here in September 2010! Ivy League is the name applied to eight universities in the US (Brown, Columbia, Cornell, Dartmouth, Harvard, Pennsylvania, Princeton, and Yale) that over the years have had common interests in scholarship as well as in athletics. The phrase was coined by Stanley Woodward, New York Herald Tribune sports writer, in the early thirties. In the year 1945, the presidents of these universities entered into an agreement "for the purpose of reaffirming their intention of continuing intercollegiate football in such a way as to maintain the values of the game, while keeping it in fitting proportion to the main purposes of academic life.'' It is interesting that the league was aimed at excellence in inter-collegiate football. The term also has connotations of academic excellence, selectivity in admissions, and social elitism. The use of the phrase is no longer limited to athletics, and now represents an educational philosophy inherent to the US’s oldest schools. In addition, Ivy League schools are often viewed by the public as some of the most prestigious universities worldwide and are often ranked amongst the best universities in the United States and worldwide. In science and engineering Russell Group universities represent strength in depth both in research and teaching – they produce around 30% of the UK’s STEM graduates (Science, Technology, Engineering and Mathematics) and almost 80% of doctors and dentists. Similarly, through their research and teaching in the humanities and the social sciences, they help to raise the quality of life and to solve major economic social and cultural problems. They play an essential role in training professionals to serve society – such as architects, health professionals, civil servants, lawyers, town planners, teachers and social workers – and are very often one of the larger employers of staff in their cities and regions, employment which is diverse but still heavily concentrated on professional and high value roles. Obtaining a place at a Russell Group university is becoming increasingly competitive. In total, the 20 universities take in approximately 75,000 new students in the first year, every year. In 2008-9 about 8 people chased each place to the universities. Now, in 2010 it is said to have increased to 9 or 10 people for each place. 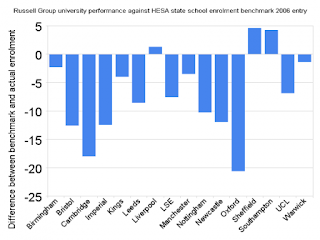 Oxford falls short by 22% and Cambridge is short by 18%.Only three Russell Group institutions (Liverpool, Sheffield and Southampton) actually beat their benchmark for state school admissions, but a further four (Birmingham, Kings, Manchester and Warwick) are within 5% of doing so. LSE, UCL and Leeds fall between 5 and 10% short. The apparent pressure that their institutions are under to admit a more representative cross-section of UK society, suggesting that this represented ‘government meddling’ in the running of these institutes, some of them have suggested opting out of state funding and therefore any form of state control. Their price for this is an end to government driven attempts to widen participation at the country’s research elite universities. In particular, they make little secret of their dislike of the Office for Fair Access (OFFA), one of the few good things to come out of the Higher Education Funding Act 2004. However, there lies the conflict of interests. On the one hand, these Universities are supposed to be the torch bearers of excellence in Education in UK. And if they have to be so, they should be given the freedom and discretion to take steps as deemed appropriate by them to achieve and maintain levels of educational excellence at dizzy heights. However, on the other hand, in order to achieve Government grant for research, these Universities need to comply with Government’s norms under HESA & OFFA aimed at equity and equality especially among the deprived and socially excluded classes. The major difference in higher education between UK & USA is the manner in which Universities and Institutes of higher education are controlled and funded. These Universities in UK have recently been permitted to have variable fee structure and focus on international students so as to reduce their dependence on Government funding. This is however, a double edged sword as the number of students in some of these Universities has gone up. The intake in LSE for instance increased from 3000 in early 80s to about 9500 now. While 38% of funding comes from overseas students, the fact remains that the quality takes a beating somewhere. It is thus credit worthy of University of Oxford & Cambridge to be ranked joint 6th among the top 100 universities in the World. Princeton, is ranked 5th and LSE, alas, is ranked 86th ! (I certainly was hoping of a higher ranking. Anyway, now that we have arrived, I hope the ranking can only go up from here!). It was again surprising for me to discover University of Buckingham till recently was the only private university in UK. Buckingham's funding regime is not like that of other UK universities, but rather is on the model of many US universities, as it does not receive direct state funding. Only very recently, the new coalition government declared an interest in expanding private higher education, and gave university college status to the American-owned BPP University College of Professional Studies, which unlike Buckingham is a profit-making body. It’s a long way before Russell Group of University can be in the same league as Ivy League of US. Nor that it matters much especially as Oxford and Cambridge seem to be doing better than some of the Ivy League Universities. An interesting debate has been going on these days with the announcement by Nick Clegg on a proposal of fee hike for higher education in UK. David Cameroon has requested liberal democrats, his coalition partners to back "compromise plans" for university funding on October 11, 2010 as rebel Lb-Dem MPs have threatened to oppose increase in tution fee. The package is likely also to include lifting the cap on tuition fees from £3,290 to at least £7,000 and possibly higher. Lord Browne of Madingley's independent review of student finance, which reports on Tuesday, is said to recommend removing the cap altogether, although that would be a highly controversial option for the Government to adopt. But any increase in tuition fees at all will prove politically explosive for the Lib Dems, who campaigned against a rise during the general election. Mr Clegg, the Lib Dem leader and now Deputy Prime Minister, said in April the move would be a "disaster". There has been a great deal of debate about what the review will specifically propose. For example, leaks have suggested the fees that universities are allowed to charge will rise, and that there will be moves to differentiate interest rates on student loans, depending on graduates’ subsequent salary. There has been a great deal of debate around these two proposals and other areas of the review; however, more discussion about the nature and benefit of a university degree in general is required.